Chandler Martin took off at The Opening, running one of the faster laser 40 times that I have seen from a linebacker in this area in a good bit, sans Owen Pappoe, who was a 5 star from the Class of 2018. That’s definitely an increase from just a month ago where Martin did something special for an athlete who is just 16 years old. The Arabia rising senior already weighs 212 lbs. and ran a 4.64 40 time, which put Martin in rare territory, and gave him the#1 SPARQ at The Opening in Atlanta. Martin did more than just run an elite 40 time tho, he also scored a 38.4″ vertical jump and equally impressive scored a lightening-quick 4.21 shuttle time. Martin’s total SPARQ Rating: a gaudy 122.97. The only real knock that a scout could find would be that he measured out at 5’11”, which is less of an impact in today’s spread offenses. We asked Martin what he does to prepare for such outstanding numbers, “A lot of jumps and weighted runs to maximize jumping and I have to thank Team 3 Sports for training me,” he said. Martin is not just all raw numbers at a combine though, he is one of the top linebackers in the state of Georgia for the class of 2020. 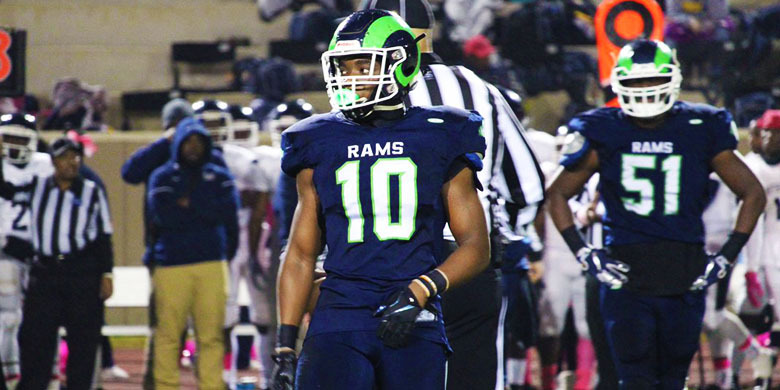 His sideline-to-sideline speed is remarkable, and allows for him to make so many plays for his Arabia Mountain squad. The fleet-footed defender is a natural at reading the play and reacting to the football, and his top-flight acceleration allows for him wreck havoc around the line of scrimmage. Martin is a hard-worker in the classroom with a 3.5 GPA and also a 22 on the ACT too. Strong academic schools should certainly be interested in Martin, and just last night Fordham offered the relentless linebacker, but we are still curious to why more D1 schools have yet to offer Martin. That’s not to say Martin doesn’t hold any offers. In fact, he holds offers from previously mentioned Fordham, Tennessee State, Dartmouth, Columbia and South Alabama. Martin has visited several of them too. Considering the entire package Martin brings to the table, colleges are really undervaluing him. Martin has the explosiveness to blow up screen passes out on the flat, and the linebacker instincts to the split the gaps, beat blocks and make plays in the backfield. Martin shows a lot of promise at WILL at the next level, he needs to play out in space, and I think spring practice where he can show off his elite athleticism will pay recruiting dividends for Martin. For now, Martin is at Kansas, on a visit where his lead recruiter is former Atlanta Falcons defensive back Chevis Jackson. More P5 schools are sure to jump on board, and be competing with Jackson & Kansas for visits soon enough, his elite combine numbers alone warrant that sort of attention. It should be an interesting spring practice for Martin (rumor has it he might get some reps at running back??) as he heads into college summer camps. A lot could transpire, and a few months from now his recruitment could be a completely different story, so stay tuned to @RecruitGeorgia on Twitter and be sure to checkout Chandler Martin’s Recruit Georgia profile HERE.